Amazon wrote me that my copy is scheduled to ship early next week. I have a review copy on the way. Hope to have a review up in the coming weeks. Well, I finally received a copy, and while I thought it was OK, it was not nice enough to keep. The supplementary material is much briefer than I thought it would be; and the layout is OK, but not special (the layout of the HarperOne NABRE, the Oxford "notes at the end" NABREs, and even the Little Rock NABRE are all much nicer.) On the plus side, the Anselm/St. Mary's publication is moderately portable for a study Bible. I think a student -- even a high school student -- would be better served by one of the Oxford Catholic study NABREs or one of the academic NRSV commentaries (e.g., HarperCollins or NOAB). 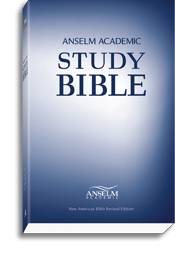 * a good Bible dictionary (e.g., HarperCollins or Eerdmans).